Winter is still with us even though technically we are three days into spring! It seems to have been a long long wet winter regardless of our lovely warm European jaunt in the middle of it. 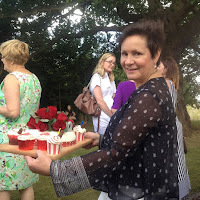 It has been a big year for me...one of celebration…first the big 60 and then a Ruby Wedding. After I got over the 60th surprise party! (I was intending to let it slide by quietly, but the man had other ideas!) We spent a few weeks deciding what type of celebration was fitting, having spent 40 years married to each other. We were well into May before we decided we would head back to the UK and celebrate our anniversary with family and friends who were at our wedding in 1975. 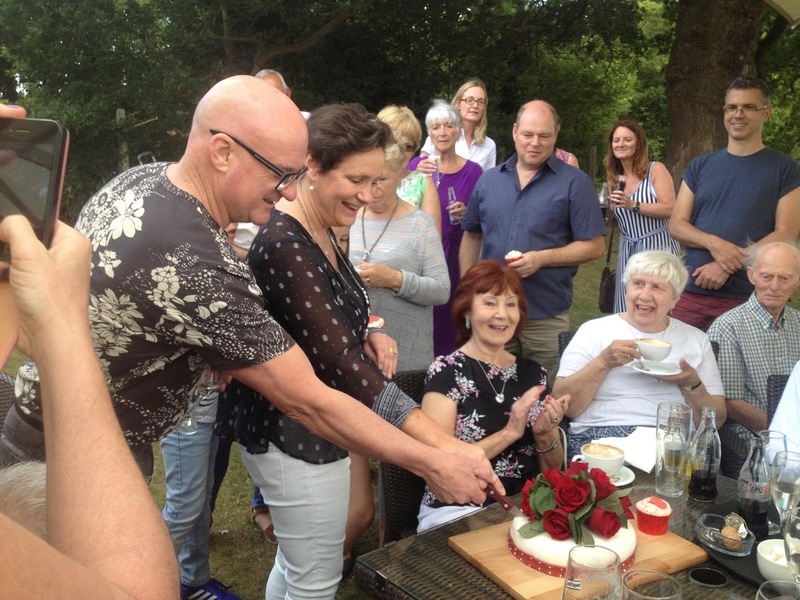 As my parents are now living in Brentwood Essex we decided on the Nags Head for a garden party as it has a perfect back patio garden surrounded by fields. So on Sunday 5th July (in 1975 Arthur Ash won Wimbledon some guests had a tiny transistor in their suit pocket listening to the game while we were saying our vows!) we had the most perfect little English garden party, with speeches and cake and a few champagnes while the sun shone. Put onions, bay leaves and peppercorns in the base of a large roasting tin, lay ribs on top. Cover evenly with a single layer of 6 bacon rashers. Pour over 3 cups of water. Cover withtin foil so the steam cannot escape, cook in preheated oven for 2 hours and 45 mins. Remove from oven and increase temp to 180C. Combine the remaining glaze ingredients in a small saucepan, whisk till smooth, bring to the boil, stirring occasionally, for 2 mins, then remove from heat. Remove ribs, onions, and pour off liquid. Place bacon on the bottom of two foiled lined roasting tins. 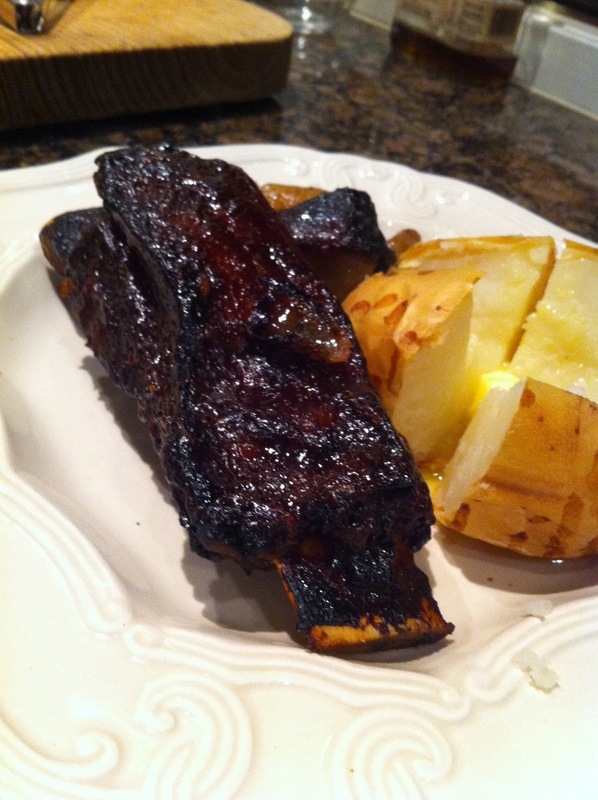 Brush ribs liberally with glaze and place on top of bacon and cook uncovered for a further 45 minutes, brushing regularly with the glaze until the meat is very tender and the glaze sticky. Give the ribs one last brush with the glaze before serving with the bacon, onion mash accompanied by baked potatoes and sour cream. 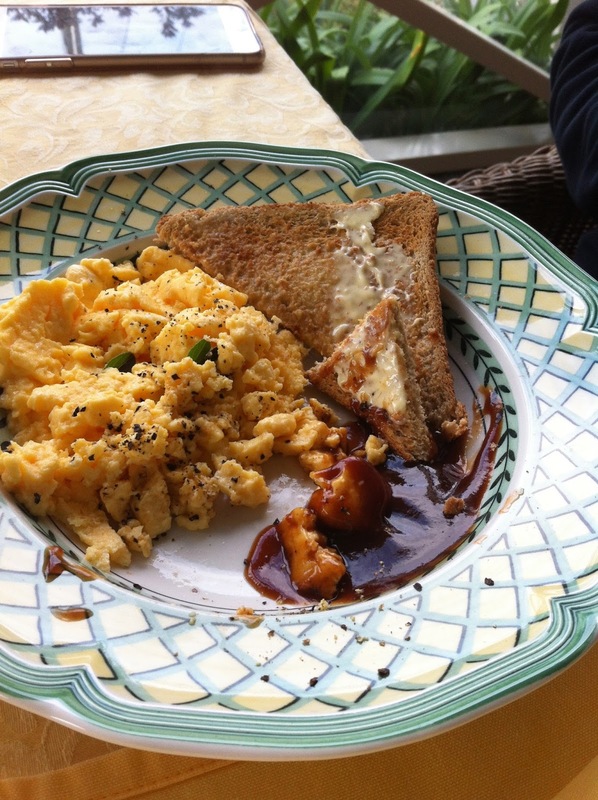 Is there anything more versatile than eggs? Cooked in a variety of ways for breakfast or a snack and added to all manner of dishes sweet or savoury. The perfect fast food in fact. Sunday morning breakfast is generally a laid back affair, including more than one pot of tea and numerous slices of toast. Breakfast is generally on the front verandah come summer or winter (in winter we have the cafe blinds down and the outside gas heater on making it very pleasant). 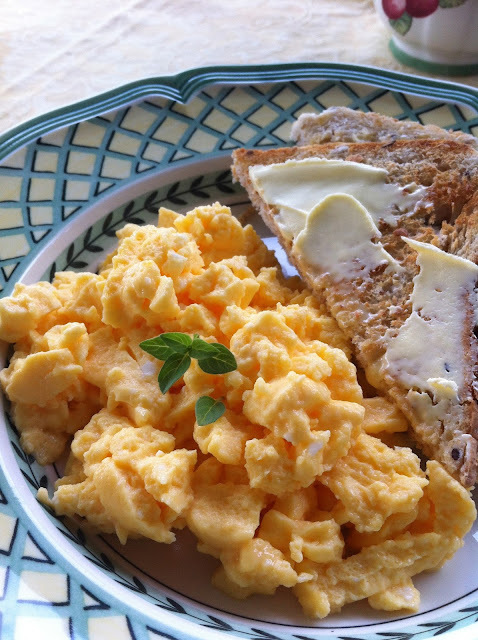 Breakfast always includes eggs in some shape or form and simple scrambled eggs is one of my favourites. I now cook my scrambled eggs in the microwave, which is so quick and eliminates the necessity of scrubbing saucepans. In a microwaveable utensil crack 4 eggs and whisk until they froth a little. Add 1/4 cup milk approx. and whisk to combine. Cover the utensil and cook in the microwave on high for 1 minute. Give another little whisk and cook for a further 40 seconds or so until there are no runny parts. Whisk gently just to break apart before serving. Some people like the added condiment of ground pepper and HP Sauce!! This makes a good size serve for two, with brekky on the table in a couple of minutes. 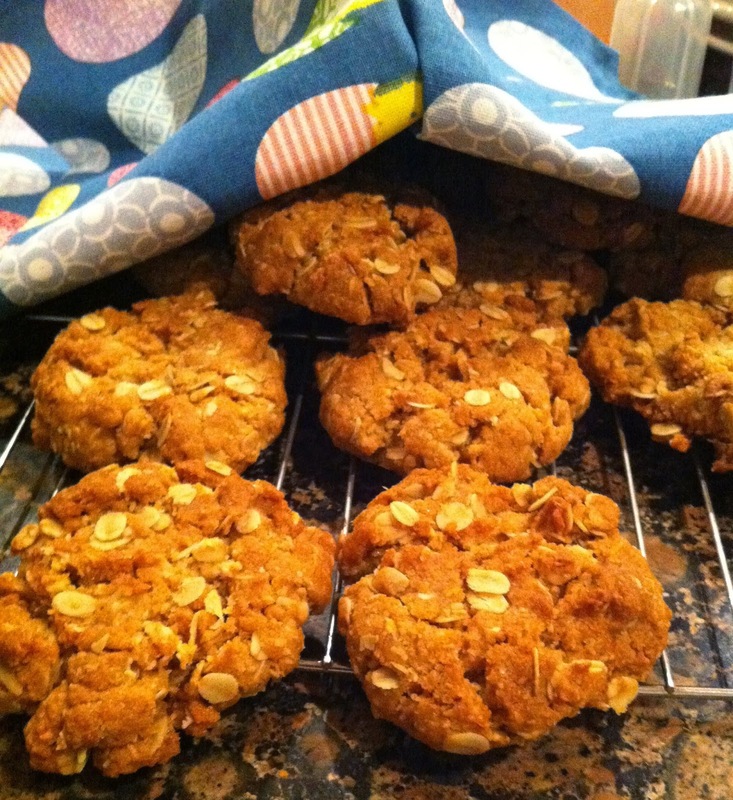 Had all good intentions of joining with Belleau Kitchen for the May challenge but missed the deadline. However, there was a good roundup of egg dishes - have a look here for egg dishes in abundance. 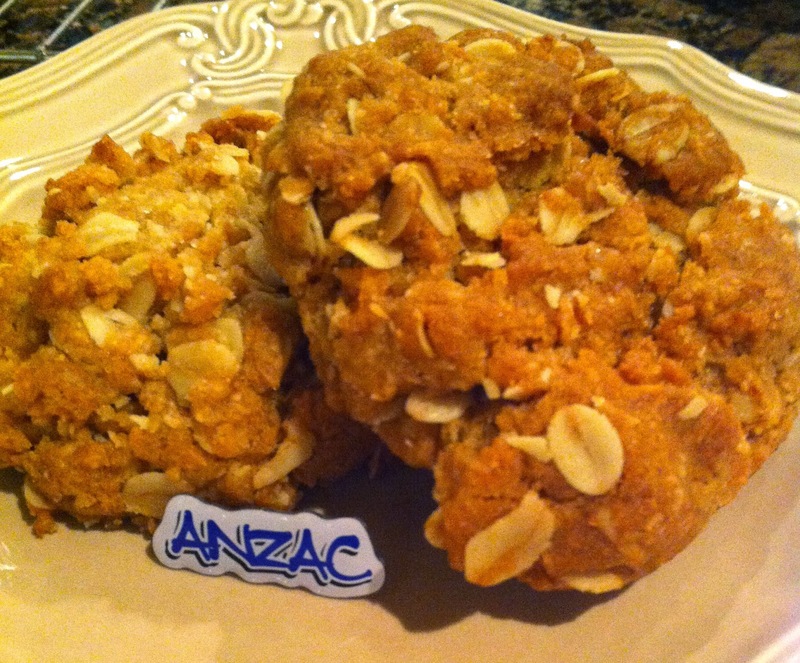 This year was the Centenary of the ANZACs, marking 100 years since Australia and New Zealand's involvement in the First World War. We remember not only the original ANZACs who served at Gallipoli and the Western Front, but also, more than a century of service by Australian servicemen and women. 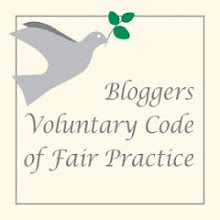 For more than a decade the school were I work has been affiliated with the Malaya and Borneo Veterans. This year was my very first ANZAC Day March where I watched our students proudly carry the banner and flags and joined with the Veterans in the march along St. Kilda Road, up to the Shrine of Remembrance in Melbourne. It was cold and wet but that did not deter our students, our veterans and the thousands of people who lined St. Kilda Road to honour our armed forces and veterans who have made the ultimate sacrifice for our country, our freedom and our way of life. Handmade poppies lined both sides of St. Kilda Road and the steps of Federation Square. Our textile students contributed 100 handmade poppies to this display and were very happy to have been part of the "5000 Poppies Project. After the march we were privileged to join the Malaya Borneo Vets at lunch where we listened to their stories funny and sad. April 25 is also the anniversary of the passing of my grandmother in 2003 aged 96, RIP Isabella Langley. My kitchen at the moment is on a health food kick. Here is a quick filling breakfast that can be prepared easily the night before and be ready to run out the door to work when time is tight. 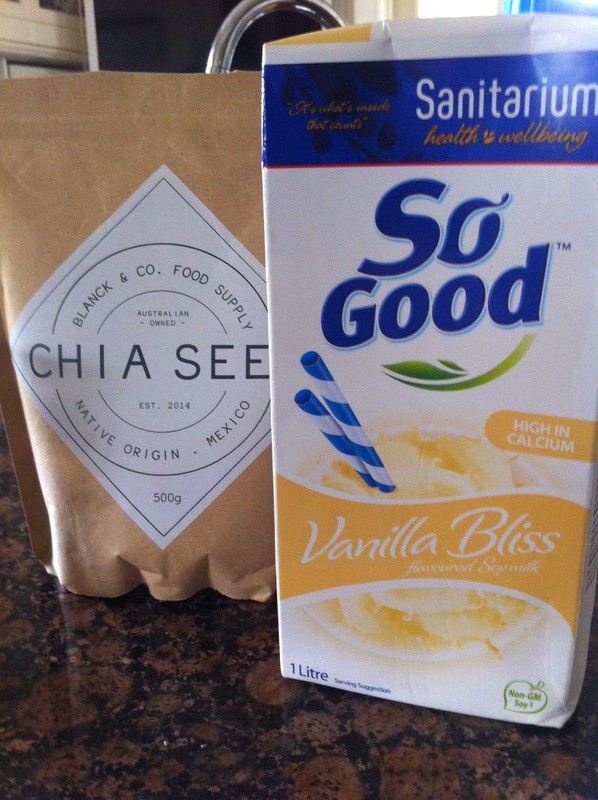 In a small screw top jar put 1 tablespoon of Chia Seeds and fill 2/3rds with milk, coconut milk or almond milk. Give it a good mix or shake. Overnight in the fridge the seeds swell to become pudding like. I topped my jar up with vanilla soy, which made it lovely and sweet. 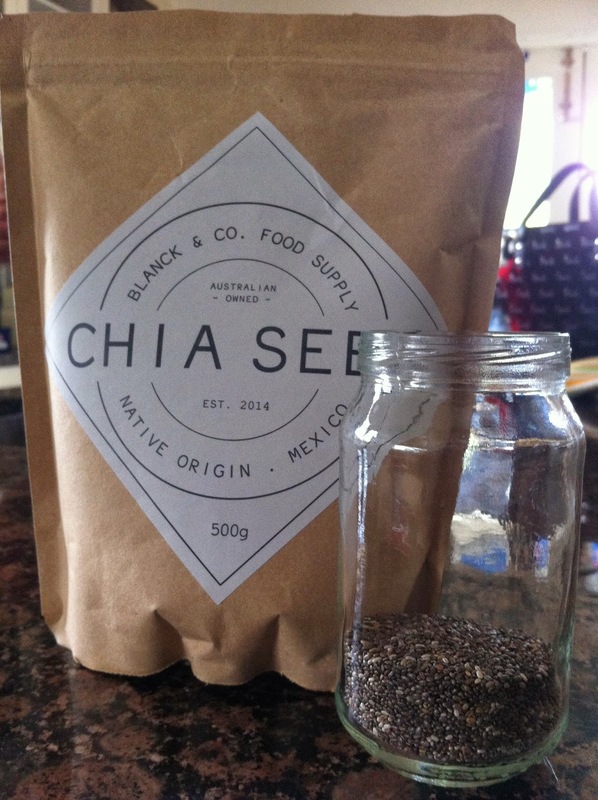 Chia seeds are high in protein, fibre, calcium, antioxidants, and omega-3s, putting them into the "superfood" category. They are often used in weight loss programs because they make you fill full for longer. However, never eat them dry as this can cause difficulty swallowing as the seeds expand they can block the oesophagus. 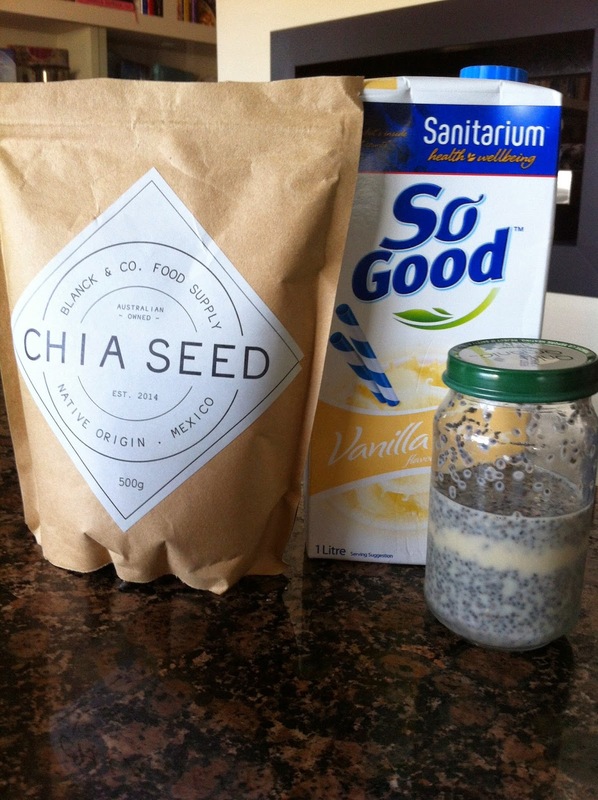 Chia seeds can be added to muffins or smoothies or sprinkled on yogurt. Go on give them a go, a nice alternative to porridge or bircher muesli. I have not been one to cook a lot of fried food and definitely not with the added calories of breadcrumbs. 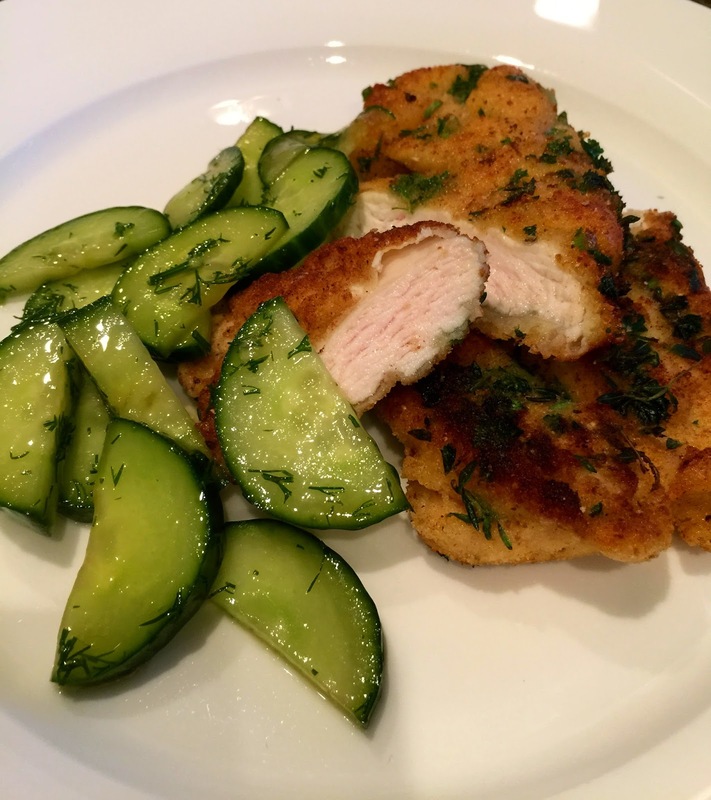 But after all the Christmas leftovers were used up and we were still in holiday mode, I enjoyed some time pouring over my new Christmas cookbooks and these chicken schnitzels by Annabel Karmel from her book Annabel's Family Cookbook, caught my eye. The cucumber salad accompaniment topped off a lovely balance of flavours too. This dish turned out to be quite inexpensive, quick, easy with not too many ingredients which hit the spot nicely on all fronts. Put the chicken on a board cover with cling film/glad wrap and hammer using a rolling pin until quite thin. Slice each breast in half. 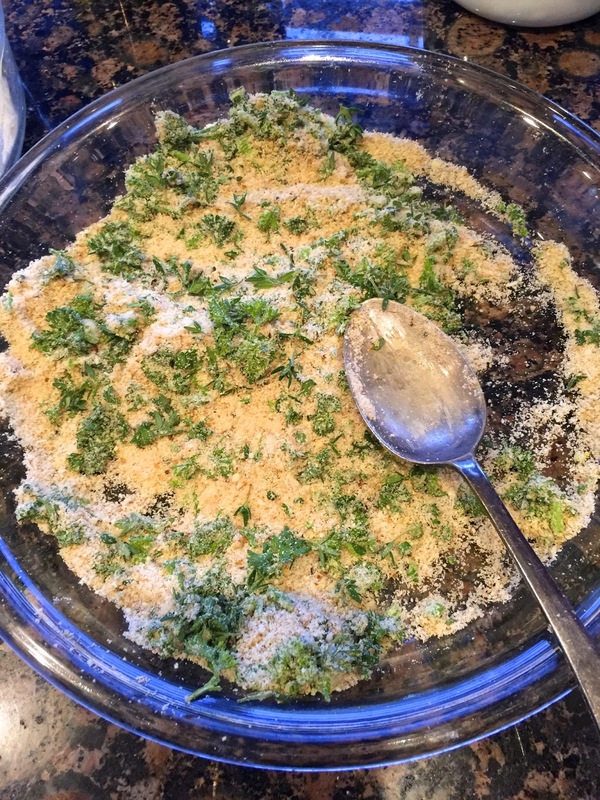 To make the breadcrumbs - tear the bread into pieces and put in a food processor with the herbs and the cheese, process until it forms crumbs. Tip into a shallow bowl. Lay the chicken in the flour and cover both sides and then dip in the egg and season and then into the crumbs, press firmly on both sides. 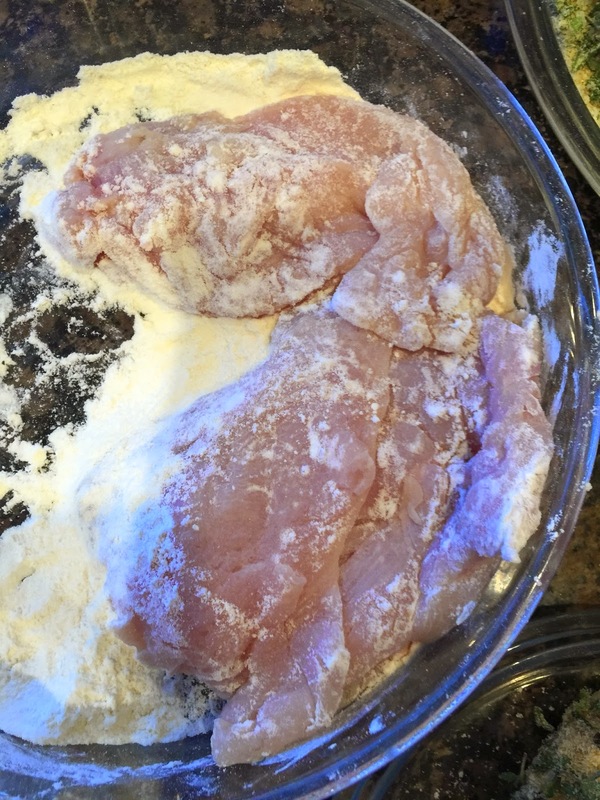 Fry the chicken for 3-4 minutes on each side (in batches if required) then set aside. 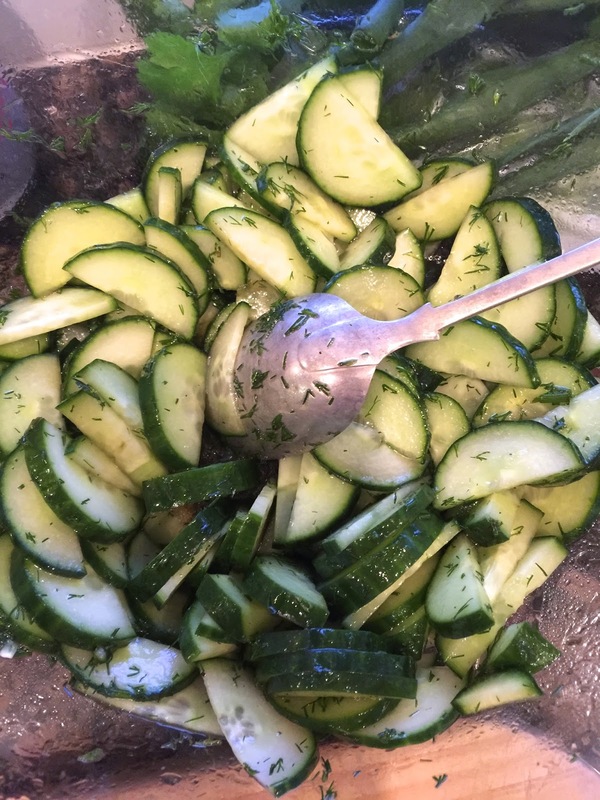 In the meantime make the cucumber salad. slice in half lengthways, then into thin half moon shapes. Place in a bowl with the dill. Serve the hot schnitzels beside the cold salad. Lovely! and not too fattening after all the christmas over indulgence.